Tubing at the Junction is one of the New River Valley's favorite traditions. New River Junction is one of the area's most popular campgrounds. The Junction is a perfect place for your next corporate or family function. We hope to see you all again in 2019! The river will draw you, gently and peacefully, as you float over small riffles in your tube. About a mile down stream the rapids are splashing. Ride the rapids a few times then visit Big Falls Park, where the park grills will be hot and ready for cooking. The free shuttle bus will be available when you decide to go back for another trip down the river. A lazy, inner tube drift down a mile of pristine river cupped in a tree-lined mountain valley provides the perfect escape from a hot summer day. Groups of 10+ people receive a 10% discount. 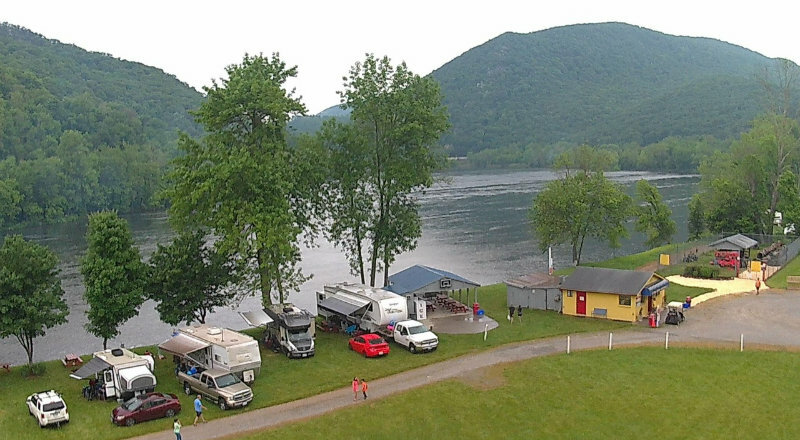 New River Junction is also a small, family oriented campground located right on the New River. Our camping area is open 7 days a week from May 1 to September 30. Reservations are required. Visit our web site for more information! (c) 2015 New River Junction Campground, Inc.